A prominent Emirati businesswoman seeks to change the widely held misconception that the Middle East is not a friendly place for female entrepreneurs. In fact, this is the reason why Raja Easa Al Gurg, managing director of the Dubai-based retail and construction conglomerate Easa Saleh Al Gurg Group, decided to write Raja Al Gurg: An Autobiography in English and not in Arabic. “I want to show the outside world what the women of UAE (United Arab Emirates) can offer. Our (national) leaders are behind this achievement,” Al Gurg said during the launch of her book in Hong Kong on Jan 16. 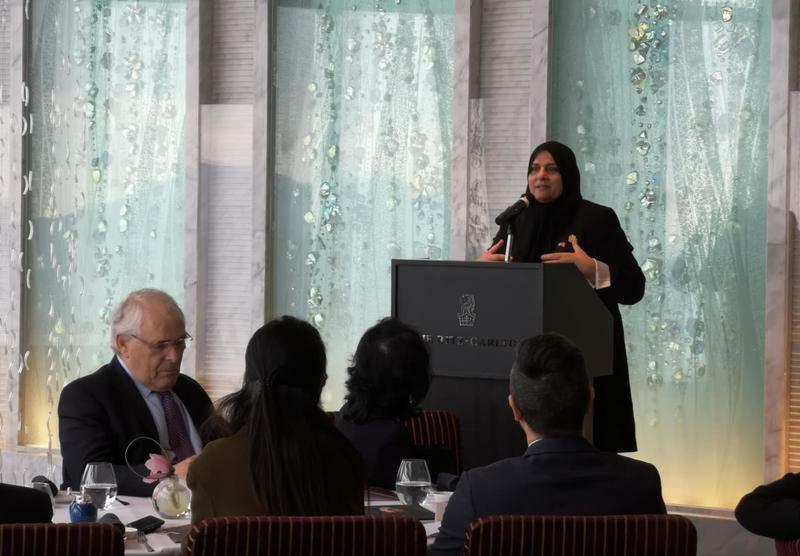 The book launch was held at the Ritz-Carlton hotel, where Al Gurg addressed a group comprised mostly of women business leaders from Hong Kong and Dubai. In her 180-page hardbound book, Al Gurg narrated about a childhood spent in Dubai Creek, her education in Kuwait, her early career as an educator and how her father mentored her to lead the family-owned business. Al Gurg said while the Arabic version of the book will be launched in the next few months, she decided to publish the English version first to reach out to a global audience. One of the questions raised during the launch was the perception that there was a gender gap in the UAE. But Al Gurg maintained that most Emirati women are in fact more empowered than what most people outside the Middle East think. “We don’t have that (gender) gap that (most) people are making such a fuss about in the world,” she said. She cited the UAE’s history. In the past, most Emirati men worked as pearl divers in the Persian Gulf. These men were usually away for a few months, leaving their families behind. It was the Emirati women, Al Gurg said, who not only took take care of the family but also managed other affairs outside of their homes. Indeed, according to the Human Development Report 2018 compiled by United Arab Emirates University in collaboration with United Nations Development Programme, the UAE has ranked the highest for gender equality in the Gulf region. The report notes that nearly 80 percent of Emirati women have reached at least a secondary school level of education, and that women accounted for over 40 percent of the labor force. Women also occupy more than 20 percent of the UAE parliamentary seats. Al Gurg, who also serves as president of the Dubai Business Women Council, hopes that her autobiography will inspire young women to pursue their own business and carve their own path. “There’s no glass ceiling that will prevent (women) from (being successful). You only have to believe in yourself,” she said. For Al Gurg, it is possible for women to succeed in business without having to compromise their family or personal life. She noted the many meetings and studies that she had to attend as a businesswoman, adding that thanks to time management she still managed to attend weddings, funerals and other social events. She was also a hands-on mother to five children and is now relishing her role as a grandmother. “Women can be successful. We can work as hard as men,” she said.